Near the northern tip of Morocco, in a pocket of sunshine at the base of the Rif mountain range, we arrive at Chefchaouen. Often called the Blue Pearl of Morocco, the town is a collage of blue and white against the earth tones of the landscape. 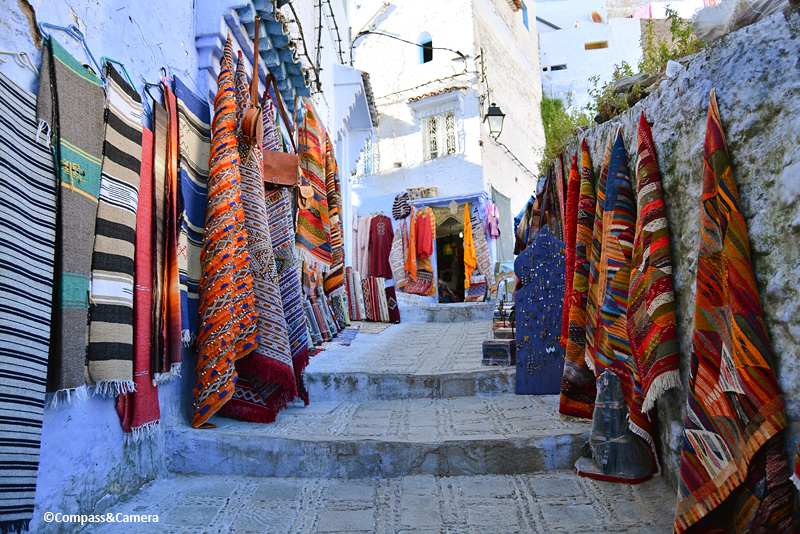 Since its founding in 1471, Chefchaouen has felt the influence of neighboring countries and cultures. 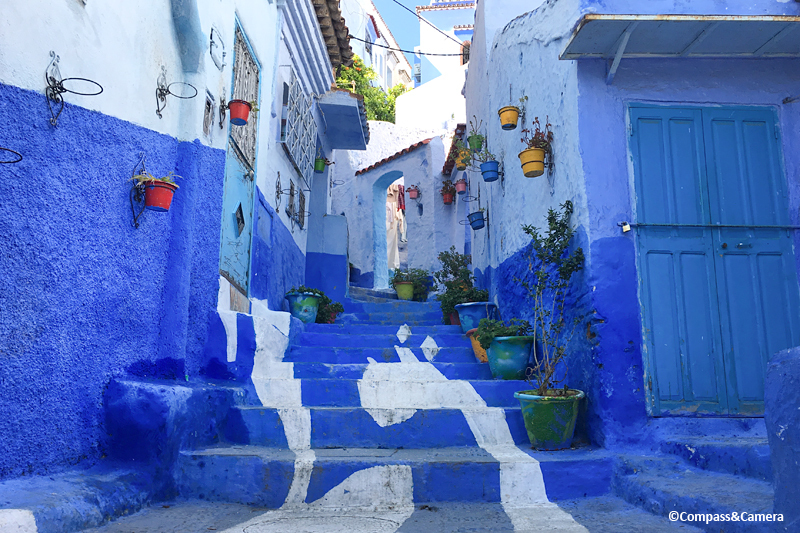 Portuguese, Spaniards, Arabs and Berbers have all contributed to the town’s eclectic character and, according to many, the earliest Jewish residents left the most lasting, visible effect on Chefchaouen through their choice to paint the town blue — symbolic of sky, heaven and god above. 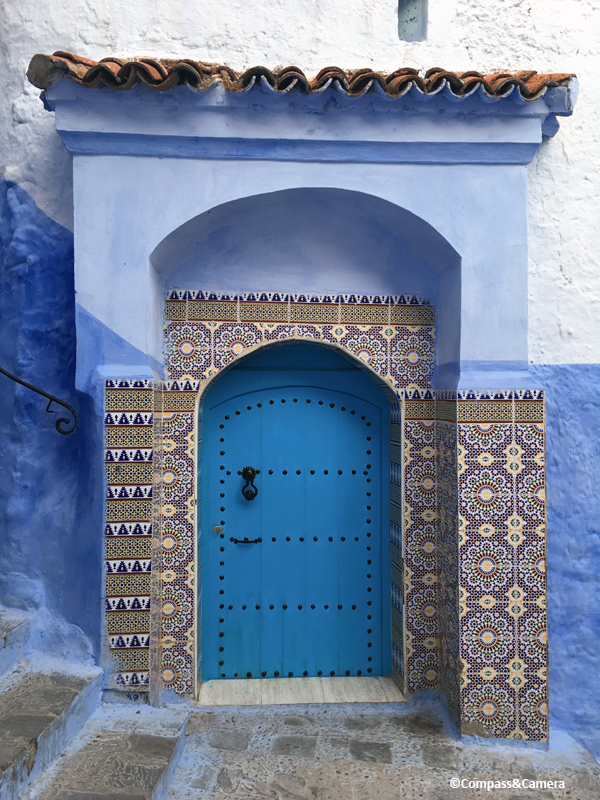 Wandering through Chefchaouen, the variations of blue feel cool and calming, aligned with the psychology of this color choice. Robes and rugs in warm hues contrast against the walls and the whole medina feels like an exercise in color theory. Johannes Itten would have loved this town. A shopkeeper, dressed in a shade of indigo, sits in front of a composition of orange. It’s as if he’s been surrounded by blue his entire life and has staged an unspoken revolt, creating a complementary universe. The beautiful imperfection of Morocco continues throughout Chefchaouen. Everything is handmade and nothing is a standard size. It’s fun to speculate what’s behind each door, especially this tiny work of art. Probably not a king-size bed! The shades of blue shift lighter and darker as the sun comes and goes, shining into each narrow lane only for a brief amount of time each day. 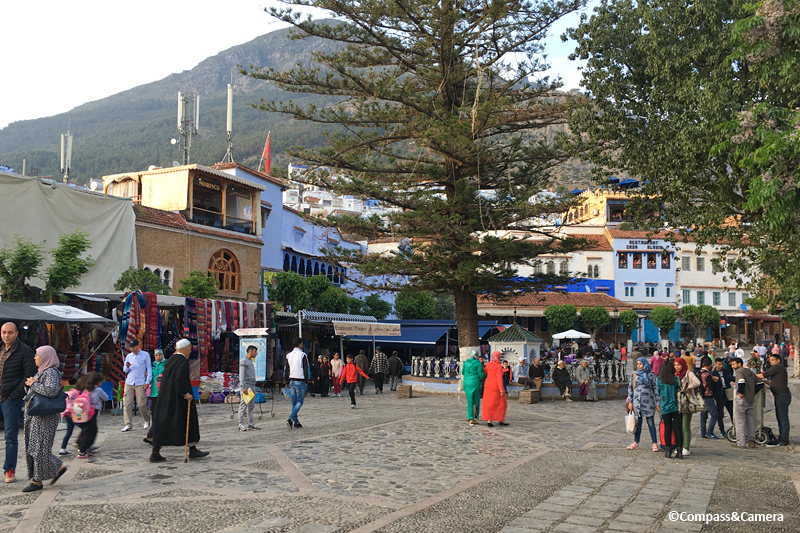 We wander downhill and eventually find Plaza Uta el-Hammam where everyone is passing through and hanging out on a peaceful afternoon in Chefchaouen. We meet a man who tells us he’s a trader from the Sahara desert. He has a stunning collection of jewelry, talismans and silver boxes. We’re drawn to a particular charm that he claims is a Bedouin compass. We buy it and he makes me a necklace for free. We’ve either paid too much for the compass or we’ve been given the gift of his kindness. I like to think it’s the latter. The following day we take a day off from traveling and languish in our room. We’ve been on the road exploring for more than two weeks and it feels great to stop and rest for an entire day — something we rarely do. Perhaps the calming blues of Chefchaouen have had a deeper effect on us than we expected. It’s nice to sit and stay awhile. Stunning! Morocco is definitely on my list. The first time I learned about a town where a lot of houses were painted in blue was probably 20 years ago on this TV ad shot in Jodhpur. I was instantly enamored of the images I saw! 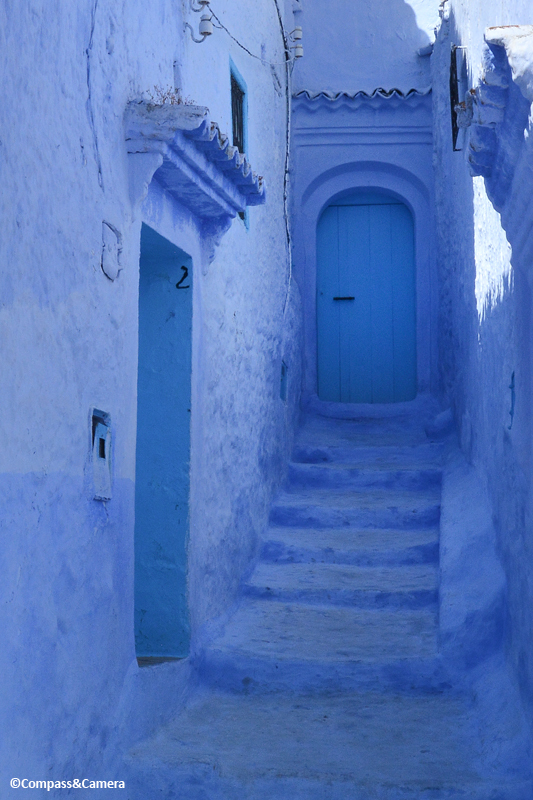 Then when I started blogging I learned about Chefchaouen which also looks impressive yet soothing — maybe it’s the blue effect. Great shots, Kelly! That shopkeeper dressed in indigo is among my favorites. Thanks Bama! Yes, Jodhpur! I’d forgotten about that blue city. I want to go there too. It looks even more blue than Chefchaouen. They could be sister cities. Thanks for sharing your thoughts! Terrific post! I have been to Morocco a couple of times so I am unsure of why I wasn’t aware of this place. It looks like a photographer’s dream and you have certainly made the most of the opportunity. Brilliant work! WOW I love this blue blue world and all the complimentary colors!! That is just a stunning feast for the eyes Kelly! The jewelry looks ancient and like no other I have seen – I need to hear you pronounce the name of this place because I have no idea how to say it. I love this post!!! I don’t quite understand why I am soooo drawn to exotic ethnic textiles, jewelry and scenery but I am. It takes me away for reasons I may never understand. Morocco is my kind of place – so mysterious and compelling. Yes, Morocco is very mysterious and compelling on so many levels. It would require months and months to really see and understand all of it. The city name is pronounced shef-show-(rhymes with cow)-en. Locals call it Chaouen for short. I’m sure you’re not the only one wondering how it’s pronounced. Thanks for asking! Your post couldn’t come at a better time. We’re planning a trip to Morocco in May, and this town is on the list of places we want to see. Thanks for sharing your moments there — lovely photography! And the colors of the rugs, clothing, etc. look dynamic next to the all-blue surroundings! Thank you. Thank you. Thank you. Hey Rusha! SO great that you’re going to Morocco! It’s an amazing country. We also went in April/May — it was a beautiful time of year and not too hot yet. In Chefchaouen, we stayed at Riad Cherifa — quiet, with a nice location at the top of the medina. They even had a small pool and rooftop deck. If you have any questions about traveling there, please let me know. Hope you have a wonderful trip! I may be calling on you for help. It’s hard putting something together from tour guide books. But we’re trying! Yes, especially in Morocco where streets are tiny and doors are closed. We tired to wing it on our first trip there, to Marrakech, and ended up wishing we had planned ahead more. I highly recommend arranging hotel/riad transfers to and from the airport or station, at a minimum. Marrakech, Tangier and Fez are all very disorienting upon arrival, especially if you’re staying in the medinas. Happy to help if you need anything! Hey! Thanks, Curt! Hope you had a great weekend. It may sound a bit trite, but that place looks really cool. Ha ha! Love your comment. Thanks, Dave! 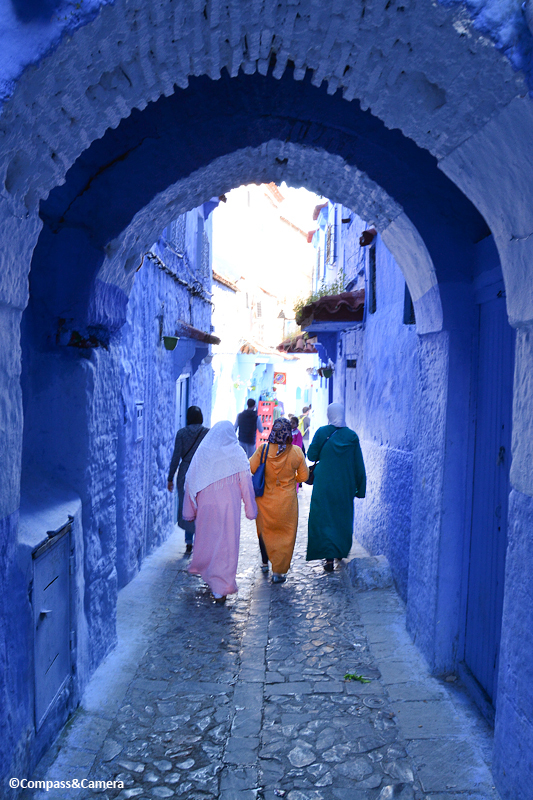 I’m drooling over Chefchaouen, and I’m drooling over your photos. Hopefully we’ll get there in the fall. I can feel a shopping mood coming on which is very rare for me. 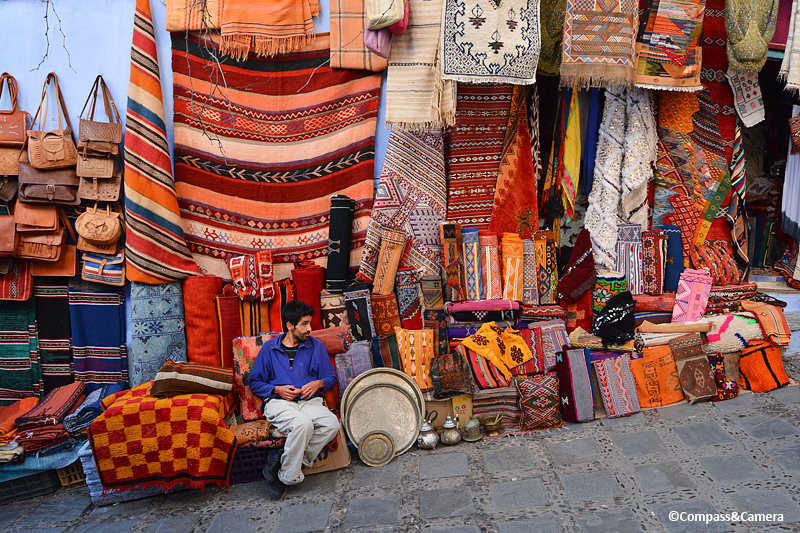 Now that we have a home we can buy stuff – and Morocco is full of stuff I’d like to own! Well, shopping in Morocco is fabulous! Just take an extra bag and be prepared to haggle (fight?) if you’re in Marrakech. It took us three trips to the same store over three days to buy the lamp we wanted. We found Tangier and Fez much more agreeable and easy going. Regardless, Morocco really has some of the coolest stuff you can buy anywhere in the world. I so wish I had brought back a colorful Berber basket. I may need to go back! Pingback: Variations on a Theme – Up – What's (in) the picture? You’re killing me. After daydreaming about the idea of Morocco with my sister recently, you have showered me with even more incentives. 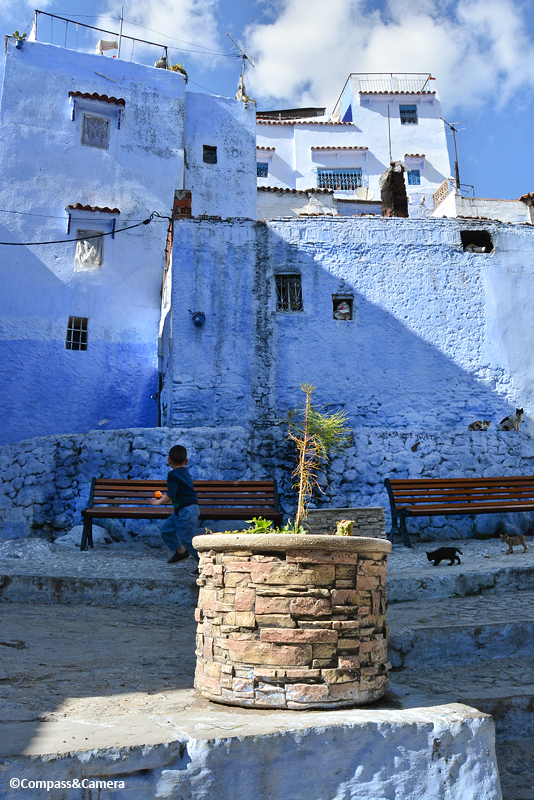 I pulled up Google images of Chefchaouen for her last week, but these are even more beguiling! This may have to be next January’s destination for sure! I kind of love that I keep teasing you with images of Morocco, ha ha! 🙂 It’s so multi-faceted and gorgeous. You’re going to love it there. Just hope it wouldn’t be too rainy in January? Would hate for you to have a repeat of Ecuador in this magical country. In any case, lots to look forward to. That IS worrisome! We will do our due diligence before choosing the next time and place, that’s for sure! Thanks, Andrew! Hope you enjoyed the weekend! Thank you for another compelling, colorful excursion to Morocco, Kelly. Love your sea of blue of beautiful little streets, arches, doors and alleyways.. We returned to our favorite place in Morocco ( Essaouira) about two years ago, after being there ten years earlier! The incredible thing was that it had not changed that much! Because the harbor there is too shallow for big cruise ships Essaouira was saved from the fate of other coastal towns that grew very wuickly to meet the needs of tourists. Ten years back we bought so many lovely pieces of Moroccan jewellry. I cannot get enough of just looking at all the treasures. Love in particular your photo of the jewellry man. Kicking myself for not going on to the “blue pearl” but hey, one can’t do it all unfortunately. Thanks for sharing these beautiful images. Love the bags of colored powders…paints? On the right, and how you put that opposite the pastel colored washing! So much color and so much blue! I bet that was a fun place to take photos. 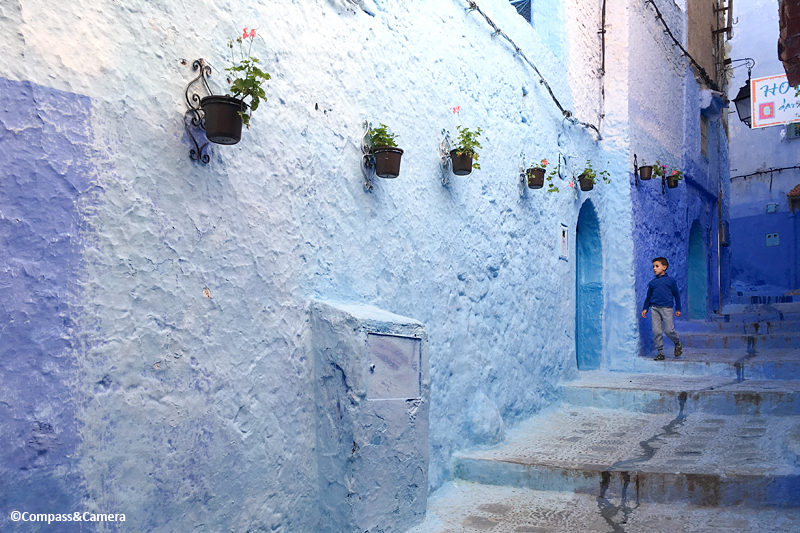 Wow, your photos of Chefchaouen are a color feast for the eyes. I don’t know if I would want to live in a town so blue, so I can understand the shopkeeper’s orange revolt. This is the first time I am hearing about Chefchaouen and I’ve been obviously missing a lot. Your pictures blow my mind. How many days would be enough to explore this picturesque place? Hey, Agness! Thanks! Chefchaouen isn’t very big. We spent two nights and three days and felt like it was enough time to walk through most of the historic and more popular areas. Hope you go! It’s a lovely place and obviously very picturesque. Thanks for your comment! Enter your email address to follow Compass & Camera and receive notifications of new posts by email.